My previous post was about how to clear the Google tracking cookies freely using G-Zapper. How to extend period of any shareware using Trial Reset ? Disclaimer: This is not a hacking tutorial.this post explains the functions of Trial Reset Software. 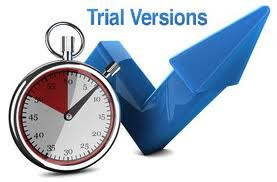 Today lets see how to Reset the trial period of most softwares using a simple and free software.Sharewares have a trial period in which you can try out their products.Usually the trial period is available for a maximum of 30 days and after which it expires and asks you to buy the product by paying them. The amount of trial days is variable and it depends how many days the authors of the software allow you to use it. A Question still remains in your mind that how the Sharewares come to know that the trail period has expired.years back the trial period was easily resettled by simply changing the date and year of the windows clock .But in recent times this method is considered obsolete. now a days these sharewares drop an info about when u started using the software and make a file or simply inserts it in registry with random names and so its not possible to find out which file or registry location records or saves that info.But somehow its possible using File Monitor software or Registry monitor software but its a very tedious and time consuming task. 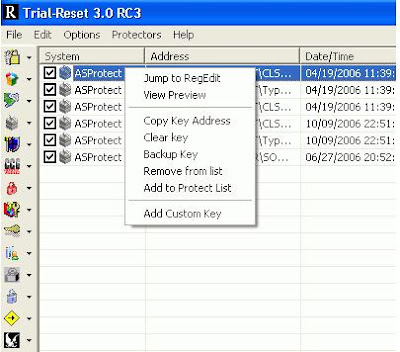 Trial-Reset 3.0 is created by Boss which can scan and remove 34 types of freeware and commercial protectors. Trial-Reset a registry cleaning too and the main function of it is to remove the keys generated by freeware or shareware protectors.It doesnt not crack the software instead resets it.